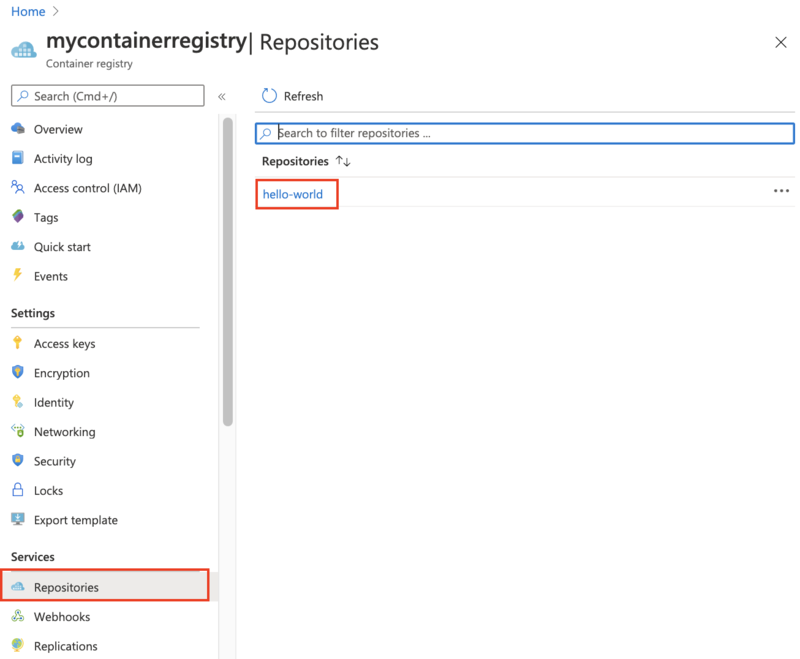 An Azure container registry is a private Docker registry in Azure where you can store and manage your private Docker container images. In this quickstart, you create a container registry with the Azure portal. Then, use Docker commands to push a container image into the registry, and finally pull and run the image from your registry. To log in to the registry to work with container images, this quickstart requires that you are running the Azure CLI (version 2.0.55 or later recommended). Run az --version to find the version. If you need to install or upgrade, see Install Azure CLI. You must also have Docker installed locally. Docker provides packages that easily configure Docker on any Mac, Windows, or Linux system. Select Create a resource > Containers > Container Registry. Enter values for Registry name and Resource group. The registry name must be unique within Azure, and contain 5-50 alphanumeric characters. For this quickstart create a new resource group in the West US location named myResourceGroup, and for SKU, select 'Basic'. Select Create to deploy the ACR instance. 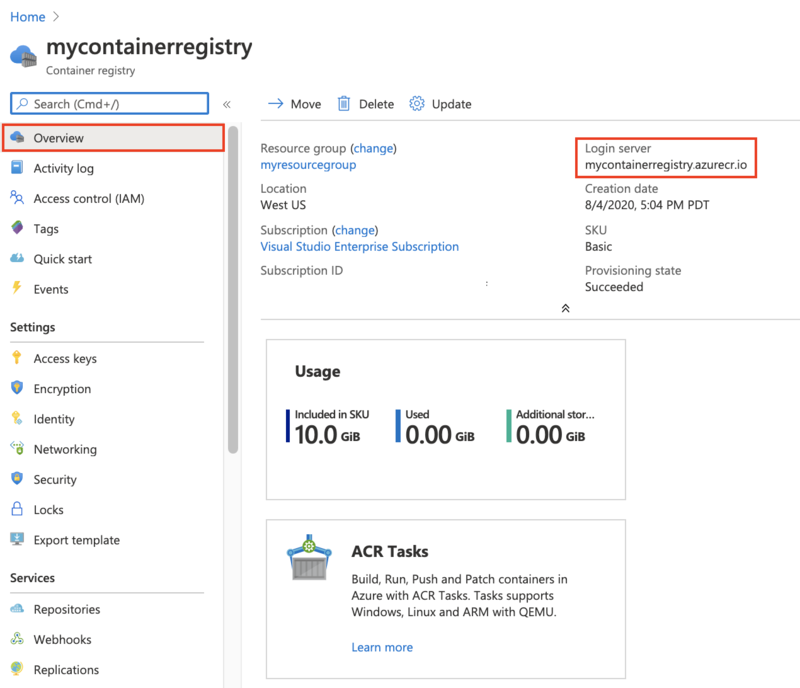 In this quickstart you create a Basic registry, which is a cost-optimized option for developers learning about Azure Container Registry. For details on available service tiers, see Container registry SKUs. When the Deployment succeeded message appears, select the container registry in the portal. Take note of the value of the Login server. You use this value in the following steps while working with your registry with the Azure CLI and Docker. Before pushing and pulling container images, you must log in to the ACR instance. Open a command shell in your operating system, and use the az acr login command in the Azure CLI. The command returns Login Succeeded once completed. To push an image to an Azure Container registry, you must first have an image. If you don't yet have any local container images, run the following docker pull command to pull an existing image from Docker Hub. For this example, pull the hello-world image. Before you can push an image to your registry, you must tag it with the fully qualified name of your ACR login server. The login server name is in the format <registry-name>.azurecr.io (all lowercase), for example, mycontainerregistry007.azurecr.io. Tag the image using the docker tag command. Replace <acrLoginServer> with the login server name of your ACR instance. Finally, use docker push to push the image to the ACR instance. Replace <acrLoginServer> with the login server name of your ACR instance. This example creates the hello-world repository, containing the hello-world:v1 image. To list the images in your registry, navigate to your registry in the portal and select Repositories, then select the repository you created with docker push. In this example, we select the hello-world repository, and we can see the v1-tagged image under TAGS. To clean up your resources, navigate to the myResourceGroup resource group in the portal. Once the resource group is loaded click on Delete resource group to remove the resource group, the container registry, and the container images stored there. 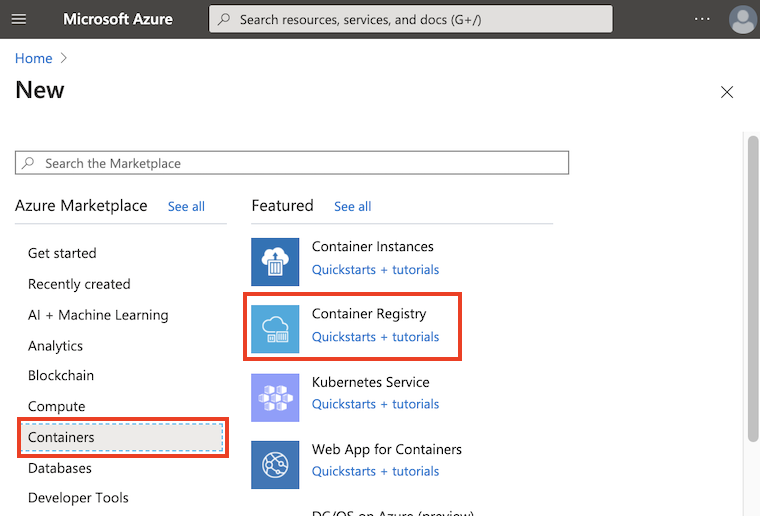 In this quickstart, you created an Azure Container Registry with the Azure portal, pushed a container image, and pulled and ran the image from the registry. 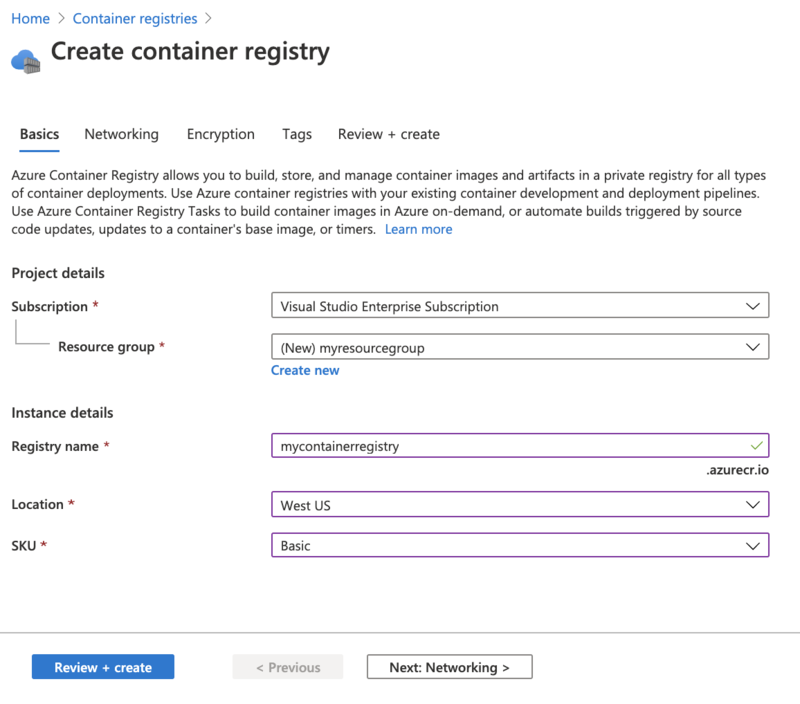 Continue to the Azure Container Registry tutorials for a deeper look at ACR.